Hold onto your butts. Telltale's sweet looking iPad adventure is almost here. Steven Spielberg's award winning film, Jurassic Park, helped define 90s cinema, ushering in a new era of storytelling (thanks in large part to Michael Crichton's epic novel) and special effects. Unless you were trapped inside some creepy person's dungeon, it was nearly impossible to avoid. As such, the license was used to create countless products, including toys, t-shirts and, of course, video games for multiple platforms, most notably Sega's Genesis, which famously let players explore the dinosaur ridden island as the heroic Dr. Grant, or as a blood-thirsty raptor. Now, 18 years later, Telltale Games revived the franchise, the result of a partnership with Universal, to create Jurassic Park: The Game, a cinematic adventure that takes place during and after the events in the film, and answers one question that's been on fans' minds for well over a decade. Just what happened to that Barbasol can? You know, the one Dennis Nedry used to smuggle dinosaur embryos from cryogenic storage. In the movie, Nedry attempts to get them off Isla Nublar during a dangerous tropical storm, only to fall victim to a goop spitting Dilophosaurus that not only blinded the pathetic lug, but also ripped him to pieces inside the vehicle. Meanwhile, the can rolled away, eventually coming to rest and getting drowned in mud. This chilling scene left more questions than answers. Most importantly, who were Nedry's business partners? 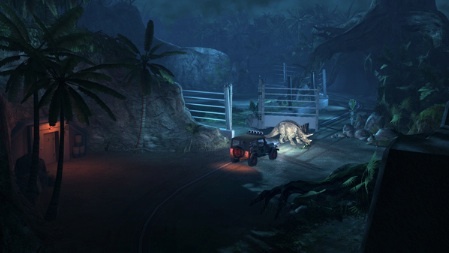 Jurassic Park: The Game, coming this November to iPad and other platforms, fills in these blanks and more, giving you the opportunity to explore the park, even going as far as to see inside that Jeep while searching for the embryos. That said, don't expect your typical slow-paced Telltale video game. Although it features a variety of puzzles, this title has more in common with Sony's Heavy Rain than Telltale's own Back to the Future series. As such, the game features picture in picture scene navigation that lets you make decisions and watch the actions unfold, sort of like a movie director. 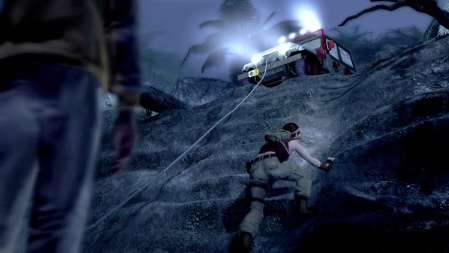 Once in a scene, you can freely maneuver the camera to search for objects you can interact with. There's also a means of communicating to various characters, loosely based on Mass Effect's conversation trees, something Telltale calls "dialogue on demand," though from what we've heard, you don't have as much control over the way you're perceived, and scripted outcomes prevent you from altering too much of the narrative. With this in mind, it seems like you'll interact with and control each of the story's brand new characters (yes, there were other people on the island). 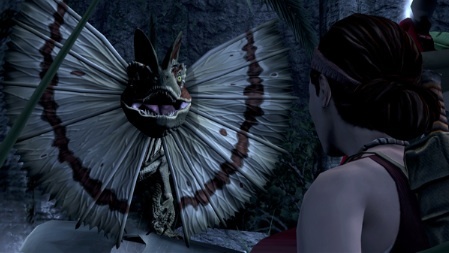 The primary goal will be to work together to survive, easier said than done, since Telltale populated the game with a plethora of thunder lizards, including the aforementioned raptors, as well as a T-Rex (you must have at least one of those), Brachiosaurus, Triceratops and Pteranodon, among others. Make the right moves during scripted Quick-Time Sequences, and you'll defy death. Mess up, and the developers treat you to a gruesome scene of the character being devoured. As such, it's no surprise that Telltale filled this game full of action, as well as iconic scenery, including the Jurassic Part facilities and tram car ride. You'll definitely see several nods to the film, through visuals, music and dialogue. It should make for one heck of a ride. Now all we need is a firm release date. 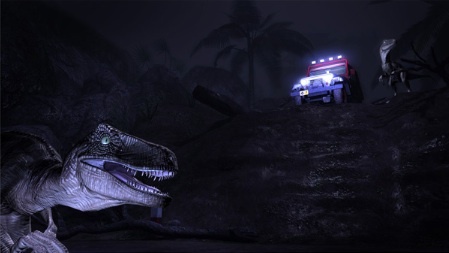 Jurassic Park: The Game hits Xbox 360, PS3 and PC November 15, but the iPad version (released episodically instead of one huge chunk) will appear sometime next month. Being huge Jurassic Park fans, we can't wait.